China’s San Francisco consulate was set on fire last night by unknown attackers. We’re barely two days into 2014, and already U.S.-China relations are off to a rocky start. An unknown assailant set fire to the Chinese consulate in San Francisco at around 9:30 pm on January 1. According to the consulate’s statement, the attacker parked a mini-van in front of the main entrance and emerged to pour two buckets of gasoline onto the consulate’s door. He or she then set the gasoline on fire. There were no injuries, but the fire caused “severe damage.” Photos of the fire and aftermath are circulating on Chinese news media. 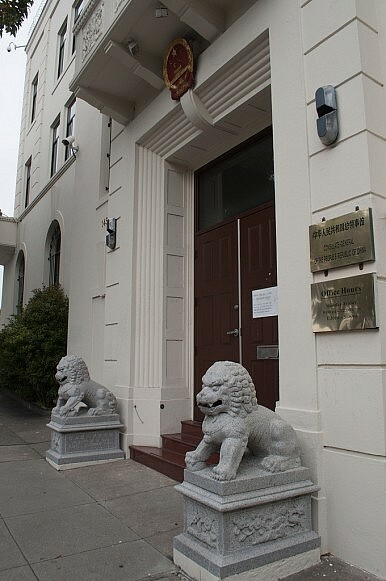 The consulate’s statement “strongly condemn[s] the despicable act” and urged the United States to “take all necessary measures to provide adequate protection for Chinese consular personnel and properties, and bring the culprit(s) to justice as soon as possible.” China’s Foreign Ministry also called a special press conference to address the issue. Spokesman Qin Gang repeated the consulate’s demand for the U.S. to solve the case as quickly as possible, to “bring the perpetrators to justice,” and to strengthen security to ensure to guarantee there will be no similar incidents in the future. The U.S. government is taking the incident seriously — the Chinese consulate’s statement noted that both the fire department and the U.S. State Department’s Bureau of Diplomatic Security arrived “immediately” after the attack. In addition to the San Francisco police and fire departments, the FBI is reportedly investigating the case. As of now, no arrests have been made, but security has been increased at the consulate. How events unfold from here could help set the tone for U.S.-China relations in 2014. There are bound to be questions and outrage within China over how such an attack could be allowed to occur. A swift investigation that successfully identifies and arrests suspects would go a long way towards ameliorating the justifiable anger Chinese might feel. On the other hand, should the investigation drag on without results, it could contribute to the perception that the U.S. has no real interest in a cooperative relationship with China. Some in China already feel that the U.S. is only out to contain China’s rise – should the investigation hit a dead end, it will almost certainly be viewed as evidence of this theory. In addition, there is the issue of who is behind the attack. The U.S. is home to many activist groups that do not look kindly on China, from Uyghur and Tibetan activists groups to advocates for the Falun Gong, a religious sect outlawed within China. It’s hard to imagine any of these groups actually plotting an arsonist attack on a Chinese consulate, as generally their activities are limited to demonstrations or information campaigns. Still, should the attacked be found to have ties to any of these groups, it would hurt U.S.-China relations. The U.S. would be blamed for allowing such groups to operate on American soil, which might again contribute to perceptions that the U.S. government is part of a conspiracy to undermine China domestically and internationally. Finally, there is the issue of different justice systems. In the Chinese system, an arrest almost guarantees a conviction. In the U.S., should there be extenuating circumstances (such as mental health issues), it’s not impossible that the arsonist might face a shorter sentence than the Chinese would like. The issue could be especially dicey, with the Chinese government already calling for the “severe” punishment of the attacker [Chinese]. Much is still unknown about the attack, and even under the worst case scenario it’s unlikely to have a serious impact on U.S.-China relations. The damage, if it occurs, will be more subtle — a shifting of the balance further towards mutual distrust and away from real cooperation. All in all, it’s not a great way to start the new year. Chinese and Western media seem to disagree on whether the suspect is a Chinese or American citizen.